Enjoy the year-round comfort of a Daikin heat pump—efficiently heating and cooling your home or commercial property while saving you money. Take control of your environment and give your home the Daikin Advantage with advanced heat pump technology. Stay warm in winter and cool in summer. Maintain perfect humidity and get rid of stale air. It’s your home, so take control of your environment with a Daikin ducted or ductless heat pump, delivering the perfect indoor climate year-round. You deserve to feel comfortable at home. For more than 90 years, Daikin has been innovating and inventing products that deliver maximum comfort and performance. Oil and electric heating and cooling systems can hit your wallet hard and still leave you shivering or sweating. Heat pumps are extremely energy-efficient, moving heat instead of creating it. Many of our systems qualify for federal energy tax credits, and Daikin systems are often used for LEED-certified and Net Zero Energy projects. Our process is efficient too, so installing your Daikin heat pump is easy and hassle-free. Traditional heating and cooling systems have to work hard to change the temperature of the air in your home, resulting in bills that drive homeowners to live uncomfortably for the sake of saving. Daikin heat pumps work smarter, letting you keep more of your own money while living better in your home. To make your heat pump even more affordable, you may be eligible for financing and/or rebates from NB Power, NS Power, and Efficiency NS. Get the Daikin Atlantic Heat Pump Product Catalogue Today! A Daikin authorized dealer near you is ready to help you take control of your environment. Our 3D and Comfort Pro heat pump experts will guide you through the process of finding the best heat pump for your home or commercial property and installing it hassle-free. We believe in our products because we offer only the best. Enter your postal code and find your closest authorized Daikin dealer using our Find a Dealer tool. Call your chosen dealer, or use our convenient contact form to send a message to your dealer with some basic information. 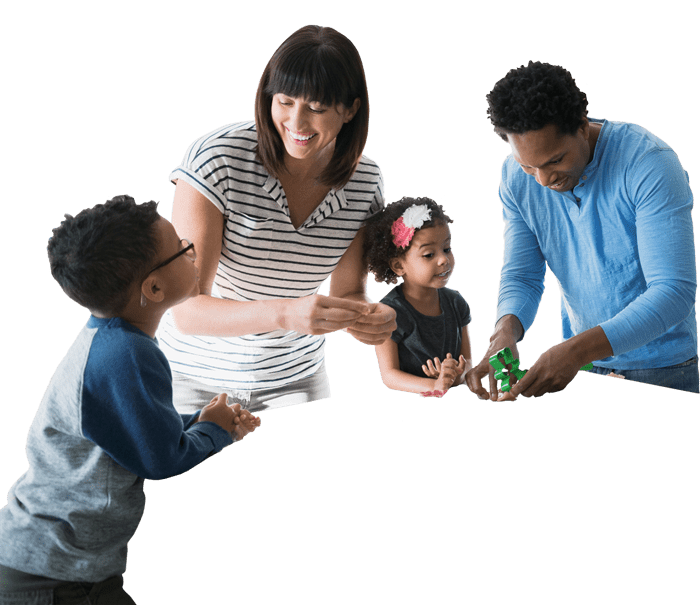 The ideal Daikin heat pump for your home or business depends on several factors, so an authorized Daikin dealer will visit the space and help you discover which unit is perfect for your needs. 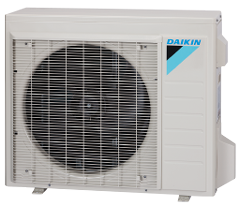 Once they determine the best heat pump for your home or commercial property, your Daikin dealer can provide you with an exact quote for your heat pump and installation. Your Daikin dealer will handle all aspects of the installation process using a team of highly trained and trusted professionals. Many Daikin ductless heat pumps can be installed in as little as half a day, and ducted heat pumps can usually be installed in one day. Unable to find requested location. Feel secure knowing your investment will be protected. Daikin’s superior heat pump technology is backed by up to a 10 year limited labour guarantee and up to a 12 year limited parts guarantee. *Some exceptions apply. Contact your local Daikin Dealer for full details. Heating makes up half the energy bill in most Nova Scotian homes, making it the single largest use of energy for most of us. Efficient heating systems can save you money, by using less energy. If you have installed a qualified heating system in the last 90 days, you are eligible to receive a rebate (up to $2,500). EfficiencyPEI offers rebates for the installation of ENERGY STAR® Most Efficient 2017 split air source heat pumps and geothermal heat pumps. 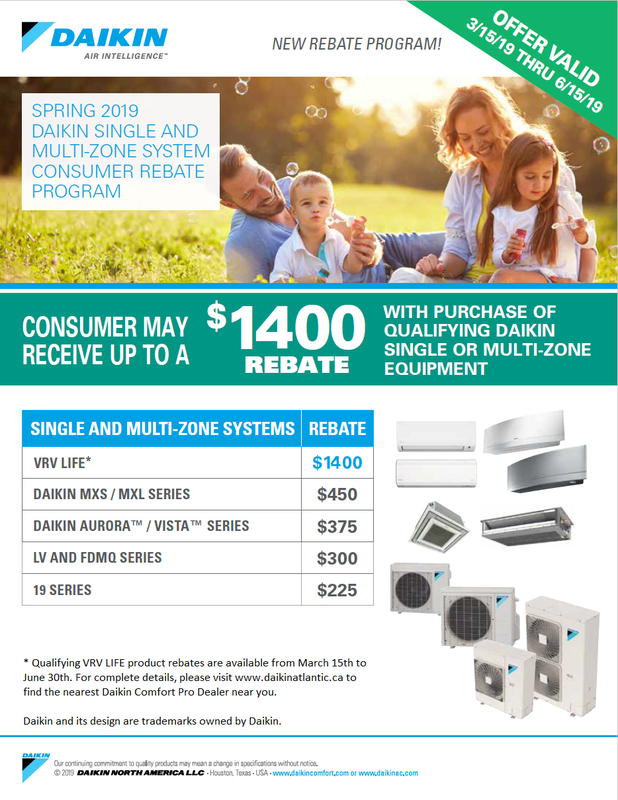 Consumer may receive up to a $1,400* rebate with purchase of qualifying Daikin single or multi-zone equipment. For a limited time, when you install select, qualifying Daikin brand indoor comfort products and systems, you will receive a Daikin Comfort Cash rebate up to $1,550* instantly! Don’t pay more to get less. Optimize your comfort and see how much you could save.